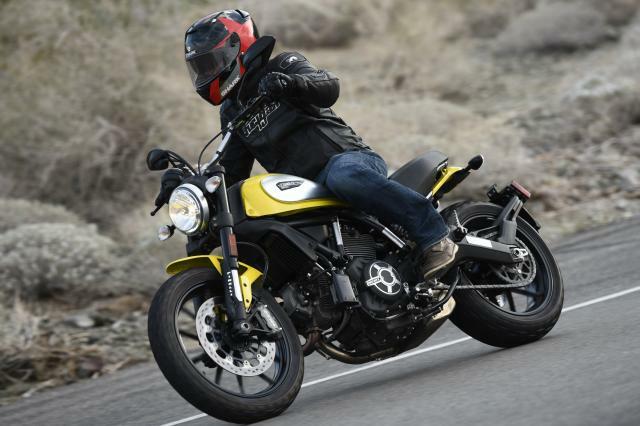 What next for Ducati’s Scrambler? What is the next step for Ducati's hip-retro brand? DUCATI always envisaged its Scrambler as a brand in its own right and not just another model in its range. Following the successful launch this year of the much-hyped Scrambler, it begs the question: where next for the brand? A quick trawl of the internet’s rumour-mongers reveals unsubstantiated tales of everything from 500cc single-cylinder Scramblers to water-cooled 1200cc machines, but when it comes to real evidence there’s little to be had. Our guess is that both those extremes are a little off target. Is Ducati likely to develop a 500cc single-cylinder engine at this stage? Unlikely, it seems. And sticking a 135bhp-plus 1200cc motor into anything called ‘Scrambler’ would steer too far south of the simple, carefree image that underpins its design philosophy. The idea of a smaller, cheaper bike is certainly tempting, but small, cheap bikes have small, meagre profit margins and rely on large production runs to achieve their financial targets. Does Ducati have the production wherewithal to make such big numbers work? We’d guess that something pricier with a healthier margin is more tempting for the firm now that the Scrambler has met with such acclaim in its initial form. But what will power it? The firm certainly has room to squeeze a bit more performance from its existing 803cc, air-cooled motor which makes 75bhp in the Scrambler but manages 87bhp in the Monster 795. If Ducati wants more power than this it will need to start raiding its water-cooled range, since the old 1100cc air-cooled Monster motor was killed when the Monster 1200 was introduced. The best option for a more powerful Scrambler seems to be the Monster 821’s 112bhp water-cooled engine, which is probably as powerful as you’d ever need in a bike with the Scrambler’s style and intentions. But how would a liquid-cooled bike sit with the Scrambler's retro appeal? So, what else could be done? Surely, given Ducati’s past record, a Scrambler ‘S’ (or the equivalent) must be on the cards. Something with, perhaps, the Monster 795-spec, 87bhp engine allied to the firm’s favoured Ohlins suspension instead of the stock Kayaba kit. You could also chuck in some funky colour options, different wheels and a new exhaust. Of course, the Scrambler is all about modifications and picking-and-mixing from the options list, but there must be riders who’d like their blank canvas to be a little stouter than the ones Ducati currently offers. So let’s open the floor. What would you like to see from the next machine in the Scrambler stable?